The golden glow hovering over the hillside seemed to carry all the emotion that was needed for the day. Soft. Warm. Happy. And as the three ‘o clock winds were driven far away by the four ‘o clock stillness, a romantic melody slipped between the blades of overgrown grass and soared heavenward. I got married on a California hillside on May 29th. Beneath a redwood arbor and across from a guy who literally is from my dreams. The 360 degree panorama showed no signs of sullied society. Just the beautiful, simple architecture of a most kind and awesome God; amongst a crowd of familiar faces and loving expressions. The slightest gentle breeze sent girl’s wispy hairs into flight and the almost summer air was fresh and clean. And now, that one most incredible, unexplainable day is stored up in my mind “like a box of photographs with sepia toned loving.” The day came and then it went like a date night at the movies and when it was over, all we could do was laugh and cry as we drove out of the whirlwind and into a place where things seemed to get a whole lot more simple for a while. During my six months of being engaged, the increasing anticipation was like living in an extended college dead-week, rushing around trying to prepare for finals. I ate weird meals on the go, I figured out how to put on make-up and eat cereal and text at the same time, and I slept with a pad of paper next to my bed in case I remembered something I needed to do the next day as I was falling asleep, a little trick that provided the bit of relief I needed to sleep more than a few sparse hours at night. Even spiritually speaking it was difficult to slow down enough to settle into my familiar place with God because somehow things like when I would get the chance to go buy more hot glue sticks for the glue gun and romantic daydreams always seemed to interrupt my prayerful thinking. Many of the times I attempted to focus on God turned into another fifteen minutes of composing a to-do list. But God is merciful and thanks to Jesus and his ever-constant efforts to keep my life moving in a direction that is fulfilling and meaningful and true, even my season of engagement chaos proved to be a time of growth and an ability to carry more responsibility. After four trial runs of perfecting wheatgrass growth, those stubborn little seeds refused to grow properly for my wedding day and I will forever resent them. So the grass was sparse but that was my only complaint of the day; hardly something to complain about. The actual wedding day was completely surreal due to how smooth and easy it was. I got dressed up. I had someone else do my hair and make-up instead of doing it myself. I sipped coffee and ate muffins and hung out with the bestest of friends in my life. And then I marched down an aisle of handpicked rocks from Montana De Oro to stand facing my favorite person in the world. And then I told him some things that I’ve been telling him for a while now, but this time it was just in front of a lot more people who cared to listen. And that was that. We pressed our lips together and the preacher told me I had a new name. It was that simple and normal. But not normal all at the same time. It was wonderful. Mysterious. Gloriously magnificent. Freaky. It felt a lot like meeting Jesus actually. Like in that moment every past relationship, every bad memory, every mistake got erased because as far as Jon was concerned it never mattered. And as I walked back down the aisle I walked straight into a new life where once again, everything was new and changed. And the whirlwind continued and came to a climax as we sprinted through a tunnel of screaming friends with neon glow sticks waving excitedly, breaking up the darkness of the evening turned night. The day came and then it went like a date night at the movies and when it was over, all we could do was laugh and cry as we drove out of the whirlwind and into a place where things seemed to get a whole lot more simple for a while. After two days in Cambria in a beautiful modern hotel, we woke up at four a.m. to drive to San Fransisco to catch our flight to sunny Puerta Vallarta, Mexico – the place where sun junkies go when even California can’t fulfill the relentless vitamin D craving. We got McMuffins for breakfast on the way and like usual for car trips, Jon drove while I slept beside him in the front seat. The next eight days were incredible and we found ourselves jumping at every opportunity to do everything our lifestyles never permitted us to do in the past two years of knowing one another. We slept in till eleven a.m. every day, we ate fancy meals at restaurants right on the beach and I even spent an afternoon watching trashy teen soap operas just because I could. But mostly we just enjoyed each other’s company and talked about how cool it was that we could officially plan our future lives together now. We spent a day riding mules and zip-lining through some trees. I spent some time bugging Jon to tell me about his favorite baby names. And without sounding too cheesy or sentimental, it was honestly a week of just realizing why I fell in love with Jon in the first place. He’s my favorite person to be around and thank God somehow I got him to think the same about me. Our two story, two bedroom apartment overlooks a parking lot and a few more two bedroom, two story places. And as I drum my fingers across the keys to type my sweet husband is sitting on the next chair over strumming some lovely song on his guitar. Marriage is sweet. And I haven’t yet come to the valley of resentment or to the low places that I hear I will experience sometimes in marriage – so far I think God has been allowing me to experience the simple, unmerited gift of being imperfect yet feeling utterly secure and safe – so I can only write about the sweet strolls through the meadows of commitment and the fact that it’s lovely to share more life with him than I ever have with anyone else. And the best thing about marriage is that I get to keep the details between myself and my other half. It’s a special kind of relationship where the world is left uninformed and so it remains a mystery. It’s the greatest thing to know someone, to share the special things in life, and to keep the secrets. And it’s just one of those things where once you’re on the other side you can truly say the grass in greener. And it is. It’s really green over here. It’s December, but it’s all sunshine outside with pink glittery stars growing from all the tall trees outside my apartment and the grass is like thousands of soft gold strands that gently bend in the breeze like little ballerinas. Bluebirds wake me each morning with a sweet song and follow me wherever I go, singing a chorus of happy tunes. And they tuck me into bed at night with one of their songs and a kiss. This is a season of my life that will never come again. And that’s a good thing. It’s special that way. I have a sixty year old piece of hardware wrapped around one of my fingers, a worthy man who put it there, and I’m preparing to choose between taffeta and silk, a very weighty decision indeed. And suddenly I’m wondering if it’s still okay that I sleep with my childhood blanket each night. Everyone seems to have a different opinion. My life has, almost overnight, morphed into a string of ever increasing important decisions, so much so that I hardly realized that Christmas will be here at the end of the month and I will be nearly five months from marriage. It’s wedding season and I’m preparing as best I know how. And regardless of how much or how well I prepare, on May 29th 2010 it will happen; I will make a set of promises that last a lifetime and I will become the strange and beautiful phenomenon known as a “wife”. So although in a sense the bluebirds are real, at times the reality is so overwhelming that I admit I’ve shot a couple bluebirds and the flock continues to diminish as the weeks go by. God is the same, which is comforting. Very comforting. Because marriage is by far, thee most challenging and worthwhile pursuit I’ve ever set out on, next to deciding to follow Jesus, of course. And I’m reminded of the difficulty almost daily as I stop to notice that I’m feeling a little “off” most of the time. I’ve picked up running as a hobby again as an attempt to balance myself out and I’ve also started playing the board game Settlers. Because unlike planning a wedding and a future, it’s something I can put my mind to for a couple hours and then its game over. So there’s a huge feeling of instant accomplishment and relief. So here’s to the new year and the official countdown to bride-dom that begins after the holidays. And here’s to shorter chapters because I really am too busy to sit down and write for very long these days. I’d much rather spend time dreaming up dreams with my fiancé and trying to actually write a Christmas card or two! The pumpkin display is back. I showed up to work on Saturday morning to sell newspaper subscriptions outside Trader Joes and sitting atop a bed of waist-high hay bales the large family of bright orange pumpkins sat smiling at me, telling me that Fall had arrived; every cafe in town had pumpkin flavored drinks featured on the blackboards with the neon writing, making pumpkin spice the new vanilla. The calendar officially proclaimed Autumn on September twenty-second and I was convinced of this as I drove through Cayucos two days later on a leisurely evening drive, down the road along the beach, where by seven o’ clock it was already dark and deserted and all the funky surf shops and pizza places looked as though they’d been abandoned; as if the swine flu and come and taken everyone. It’s strange when the beaches are empty. It looked like summer had taken off with the tourists. So once again I prepared to settle into the new things that summer had inevitably stirred up. Summer wasn’t quite what I’d anticipated this year. I didn’t go surfing – not even once – a reality that violates the carefree stereotypical California dream I still keep alive in the back of my mind. I never took a road trip to visit all the nostalgic cities along the coastline. I never met a celebrity; the closest I came, which really wasn’t close at all, was purchasing a three dollar painting from an eccentric couple having a yard sale in Beverly Hills because it was the only thing within a fifty mile radius I could afford and they told me they knew lots of celebrities through the night club circuit. And I never took the plunge; skydiving that is. Something I was so set on doing because I decided I wanted to begin the tradition of doing something completely risky and exhilarating every summer to celebrate the most amazingly risky decision I ever made in buying a one-way ticket to San Luis Obispo in the summer of ’08. A kind of anniversary, if you will. But this summer, like a 1930s film, was all about love: love for Jesus, love for myself, love for Jon and everybody else in my life. And this time around love didn’t beckon me to run off to far away places and romantic summer getaways like I’d known before. It came quietly; it was subtle. Like a neighbor asking to borrow sugar; and easily turned away, love showed up at my door. The beginning of summer was violently busy. The Lighthouse began the voyage of moving across town – a process that took about three weeks and thirty-plus friends to accomplish because of the volume of oversized furniture and the infamous mountain-pile that had accumulated in the center of our garage over our year-long stay. We moved across town to a quaint condo complex near Laguna Lake that resembled Disney Land Boulevard, with a unique circular set-up so that each condo faced inward towards a small grassy hill. Above each doorway hung a white ball- the porch light- dangling like a Christmas tree ornament and the London-style floor plans that made the buildings narrow yet four half-stories high. And to make this move even more divine, Jon moved in with three guys in a condo right across the parking lot. Along with the big move, Jenna and I headed off towards Badger, California to accompany over one hundred Jr. high and high school students to Mercy Church’s second ever attempt at youth summer camp. An experience I resisted just as much as I embraced because there’s something about being around sixteen year olds that causes every last insecurity hiding underneath thick layers of psyche to come out thrashing like a wild baboon caught in a hunter’s trap. And upon returning to San Luis I had one day to catch up on everything with Jon before he took a bus to L.A. to board a large cruise ship with his family for seven days of sailing and sun in Mexico. And to conclude the summer, Jon and I traveled up to Evergreen State to soak up some sun while the sun was still there. We visited the family lake cabin and drank diet-root beers with my grandparents while hearing stories about the conquests of retirement and had jumping wars on the trampoline with my little brother. I saw my best friend get married. I had a birthday; I have one every year. Except this time around about fifty of my friends decided to hike a mountain and throw me a dance party at the top. And then the summer was over. And now I’m back to fall. Standing in front of the pumpkin display. Back to the season where the leaves don’t really turn orange and brown and flake off the trees, but where it’s still mostly green around here. And once again, Autumn is turning out to be a season where the stuff I’ve been dreaming about is finally getting real. It’s not real yet… but it’s getting there. So I’m going to keep hanging onto hope like I’m halfway off a cliff and it’s my only option. Because if I’m honest, the waiting is sweet and the next chapter should be the most interesting yet. So until then I’ll keep going in circles and dropping hints like breadcrumbs along the path. Chapter four. It’s mid-spring. And chapter four means I’m rounding third and on the sprint home to wrap up an entire year in my new home of San Luis Obispo. My new home that continues to be a sky-covered sanctuary in a string of small cultured cities and beach towns with ocean boulevards fit for strolling. And I’ve done a lot of strolling in the last six months. Along sandy beaches and through the Colorado Rockies, in leaf-covered parks in Chico and downtown at Farmers like I’ve enjoyed doing since the beginning of my adventures here. Enough hand-in-hand strolling in fact that I lost track of time and forgot to make it home for dinner and to write chapter three. But the handholding was worth it. Totally worth it. So I’ve been caught up in the strolling and in all the big changes that keep rolling in one after another like the tide at Avila. And as I’m learning that no matter what I do the tide will in fact continue to roll in on schedule, I’m learning to freak out a little less when the big changes do occur. So here’s to the big changes and to the friends that continue to root themselves deeper and deeper into my life like sturdy oak trees. I’m learning to embrace them both. Every morning around 10:00am the fog kisses the roof tops of San Luis Obispo goodbye as it rises heavenward to reveal Madonna Mountain and Bishop’s Peak still standing in the golden glow of the rising California sun; still bidding me to come and climb. And on the days when I am far too preoccupied to accept their invitation to fellowship and run upward through the gentle waves of green grass, they are steady in reminding me of what I love to do; reminding me of what I was born to do; and reminding me that it’s the simple luxury of those who find the time to pursue it. And it’s similar thinking with God. I moved here almost a year ago to climb. And that’s what I’ve been reflecting on as of late. I didn’t come all this way just to gaze upon a majestic mountain and gawk in jealousy of the tenacity of those who manage to experience the beauty up close. I moved here to climb; to make it to the top myself and to know God. And a month ago when the calendar declared that winter was officially over I did two things: 1) I threw my winter boots back in the closet and painted my toes that familiar cheery shade of Cabana Sunset Pink (Because despite what everyone told me, California does in fact get cold enough for winter boots at times). 2) I finally reached out and grabbed a handful of springtime and the brilliant revelation that nobody in my life is forcing me to climb. It’s just the simple luxury of those who find the time to pursue it. Last week I decided that I will in fact be staying in San Luis Obispo. Technically I had been planning on that for a while, but it’s different when suddenly the decision demands an answer. So I will be signing another year-long lease. And I will not be moving back to Spokane. Last week I decided this after an over-dramatic cry-fest in the car next to my special-friend turned boyfriend, Jon, who is patient and kind like Sunday afternoons. However this decision to remain stationed here is significant for me. It’s simple. But it’s simple only after I work through the complicated. Because I realized that if I do in fact remain here and not move away, it will be the first time in my life that I choose to persevere through a difficult situation and not run away from my problems to a place where the grass is always greener…at first. Because this year has been incredible and full of awe-struck moments of joy like blowing bubbles. Yet, it’s similar to eating a cala lily flower: meaning that you can drink in a vibrant orange sunset with your eyes next to your special friend on Shell Beach, feel excited when he picks you a perfect white cala lily from the side of the path on the walk back to the truck, but when you take a bite out of the petal just to be cute, you get a thousand microscopic calcium crystals lodged into the membranes of your mouth and throat and end up with poison control on the line while sitting outside the ER just in case you stop breathing. So while this year has been incredible, and unforgettable, and epic, I’ve had a few “cala lily moments”. Moments where my impulsive nature, or unhindered passion as I like to call it, has landed me in situations that sting a little. Situations that I think would be easier just to move away from, rather than wait around in the parking lot until everything feels normal again. But this is exactly why it’s so important that I stay. So I’m pleased to say that God is in fact still changing me and getting me even more accustomed to the narrow path. Because the narrow path, I’ve heard, leads me straight home. And a home is what I’ve always wanted and where I’m determined now to stay. When I was born my dad was waist deep into hunting. He spent his weekends pursuing his hobby with his two loyal Brittany dogs – traveling around in the pick up and coming home with stories and dead pheasant and quail. And when I turned four, my dad gave me a whistle that he hung around my neck with a string, and lifted me into the truck where I sat in the middle seat as we drove down the highway out of town, towards the open meadows full of game. And when he was ready, he’d signal me to blow the whistle, releasing the dogs to begin their pursuit. Then shortly after I turned five my dad moved to Canada. But back in September last year I began riding around in the middle seat again. Began regaining my place as someone’s right hand girl. The truck was black and his hair was blonde and similar to me, his favorite thing to do is called spontaneous, making things like walks on the un-beaten path during lunch breaks and steadily fulfilling our lifelong goal of eating at every restaurant on the Central Coast a regular occurrence. And by the time we visited Loveland, Colorado to spend New Year’s with his family, I had already been living there for a few months anyway, figuratively speaking of course. And the holidays were like a high-end five course meal this year. Between visiting Pullman and Spokane and driving twenty-some hours back down through California in my new car, I got to revisit some old places and wade through breathtakingly new ones alongside my new best friend and self-identified climbing partner. We spent the last few days of 2008 eating red meat, watching family home movies, and running around quaint little Loveland complete with a handful of funky sculpture gardens and a frozen lake we got to skate across in our snow boots. And it was perfect: even though I dropped the $40 bottle of red wine onto the sidewalk when we were already running late for a beautiful dinner his mom had prepared. And when holiday season ended, I returned to my SLO life with the solidified conviction of heart that I’m no longer content in climbing by myself. Because everything is better when he’s around. And without him I’m stuck cruising around in the driver’s seat with only my own bony shoulder to lean on, daydreaming about him anyway. But in the midst of afternoons in front of the computer and answering the telephone with “Thank you for calling K-LIFE FM and 890AM, how can I help you?” God is demonstrating to me his faithfulness because I can feel him moving me into things more permanent in all areas of my life. And this is the truth that has kept me here for almost a year now; here in San Luis Obispo; here at Mercy church; here in the Lighthouse with my roommates; and here in this new and beautiful place with God. And I’m learning that my ability to stay here has nothing to do with my abilities, but with His. So because He is good, and because He is steady, and because He is determined to keep me, I am still here. Still experiencing his love and goodness and growing into the person I was always destined to become. And I’m still working on a real smile; one that isn’t easily wiped away like red marker on a whiteboard, which is the challenge I’m facing right now. Because a few months back I found myself beached: no longer riding the wave of excitement of living in a new place with new people and a new beginning. And the hard part comes now as the question is begged everyday: will you keep climbing? Every evening the fog drops like a final curtain call, resting again upon the rooftops, covering them like a safe blanket for the night. And all the happy townspeople of San Luis Obispo curl up in their PJs, tuck their children into bed, and they wait for a revolution to come. So I’ll continue being a part of the change I want to see. And I’ll continue to climb. PS – and as of yesterday my hair is back to blonde. I found out Freedom is a person and I finally know him. I found out I wasn’t who I thought I was and that despite my logical protesting I had no doubt been playing church for the past eight years in a lot of respects. I found out that redemption is a season and I’m currently living in it; currently running and playing in piles of orange and brown leaves of joy and a newfound steadiness of heart. Found out that right now God views me like a seven year old and I’m content to be his little girl. And as the summer season of fun and all things new has just slipped under the covers to sleep, Autumn is emerging as a time of clothing myself with some layers that are a bit thicker and meant to protect everything that’s now been established underneath all the skin and what people can see with their eyes. Yet Autumn has never looked like this before. This is the first time Autumn is, and will continue to be, a season of hope and not the beginning of an icy downhill crash. Partially because this is not Washington and the iconic leaves I’m playing in actually aren’t really changing colors all that much; stuff around here is still looking pretty green and the leaves tend to stay on the trees. And I’m confused when I walk outside in the mornings and expect to see my breath cut through the chilled air like an exhale of thick cigarette smoke; expect to spend fifteen minutes scraping my car windows with icy fingers and hot swear words because I’m already late – and like I said, I don’t even own a car here. Because this year I’m not preparing myself to suffer through a cold, dark, terribly long winter. I’m preparing to let things settle; settle into what I am becoming. Settle into this new life that I’m convinced I’m never going to leave behind now. This year, Autumn holds the promise of beauty and the new habit of early mornings spent gripping a warm cup of coffee and everything I’m now convinced is mine through True Love. And as this season slides further into focus and clarity and Change continues to be my new best friend and trusted guide, I’m predicting only good things and that this newly established pattern in my life of embracing everything that God has for me will continue to bring me further into the loving arms of Freedom. On life at the Lighthouse: Sometimes, you find yourself in a certain place where you can honestly say, “I wouldn’t change a thing.” Well I’m currently living in that place, minus the fact that I would in fact do a little something more with the color scheme of our living room. Not that I don’t appreciate the twelve different shades of tan that accent the almost-tan walls, but I think a few green house plants and a picture hanging on the wall might eventually be nice. But my issue with the color tan aside, really, I wouldn’t change a thing. Not even the spacious kitchen that amplifies every tiny clank of the ceramic dishware to let me know that my roommates are up and beginning their days before I’m ready to crawl out from under my covers. However, most disturbances to my sleep simply tend to remind me that I have people in my life who are worth waking up for; worth knowing to the fullest, even at 5:00 a.m.. So I don’t mind. And with the new Autumn season settling in, and the chilly night air pushing us to go inside, to build a fire, and to sit down with one another, we are on the brink of seeing springtime flourish inside the walls of our home despite what the calendar says. Our yellowish house with the purple trim (God help me) that goes against every vow of loyalty I made to Washington State University and the “I bleed Crimson” mentality and against my lifetime vow of hatred towards the purple and gold breed of the Greater Northwest, is becoming our safe-haven and a place where our secret prayers about who we really want to be and the reality of our lives are rapidly merging like rush hour traffic on the Autobahn. Because we’re all determined not to be alone anymore. Because we’re realizing we don’t have to be. So our times at home have been spent with each other in a perpetual game of hide-n-seek that we’ll continue to play until we all get found and manage to remain there. So I’m looking forward to many more memorable nights at home where watching television is a thing of the past. Because like I told someone the other day: “Why would I watch TV? For the first time in my life I think that what’s going on in my own life is more interesting than what’s going on in theirs.” And what’s even more enchanting is that I’m convinced this trend will never die. Like skinny jeans, it’ll always come back around; they never really go away in the first place. I think even the Pilgrims wore skinny jeans. And instead of TV we’ll continue our tradition of filming Sunday night dance videos where we’re discovering that five off-beat girls really do know how to get down. So it’s good to have friends and we’re all learning how to be one. But maybe even more so we’re learning how to have them; how to let other people in because we’ve all got our closets. I’ve got a garage, actually. So during these months of seeking coziness and people who are comfort like blankets, I’ll continue to barge into their rooms because Lord knows they’re already barging into mine; because that’s really what we all want if we’re being honest. It’s funny though because when we named it the Lighthouse I’m not really sure we knew what we were in for; not sure we realized how prophetic that name over our house would be. But it is, and so as we continue to settle further into each other we’ll keep striving towards a colorful horizon that will not disappoint. Because if there’s one thing that California knows how to do best, it’s put on a vivid display of color every night as the sun hits the hills. And it’s obvious: sunsets are meant to be shared. On the topic of love: Well I had a buddy in college who had a tendency to drink too much beer and then when the commotion of the night came to a close, in a very serious manner would sit me down on the rugged green couch in the living room that faced the mounted elk head, named Eleanor, that hung above the fireplace and there he would tell me all about how love was a lot like fishing. Now seeing as I’m a city girl – who holds a definite attraction to country music, but nonetheless has spent the majority of life listening to Kenny Chesney and Garth Brooks sing about the cowboy life from within a world of suburbia where my dad taught me how to grab a phone book when I needed an oil change or my tires rotated – I no doubt had a lot to learn. And although my buddy was influenced more by the infamous Jack D. and sly Mr. Coors than any other reliable source of wisdom during those late nights on the couch with me and Eleanor, he sure did teach me a lot about fishing. So as certain events have been unfolding in my life with a certain incredible someone, I’ve found myself thinking a whole lot more about fishing and thinking that its just about time that I start living out my own song and not just singing about someone else’s pretty story. And I’m discovering that it really is quite enjoyable and I’m thankful that I’m getting to build a genuine friendship with this someone amongst the growing backdrop of relationships with my new family here and within the reservoir of a church that is destined to do mighty things. It’s amusing though because I’ve been forced to swallow my own flippant statement as of late regarding the peculiar title of “special friends” that the twenty-somethings in my church have creatively placed over developing guy-girl relationships. I remember the first time I heard someone mention the phrase “special friends” I almost choked on my carrot stick. I had only been in San Luis Obispo for about a week and upon hearing it, in a careful whisper, I turned to my new roommate Jenna and said the words: “Seriously shoot me in the face if I ever have something called a special friend.” But God is funny and in recent weeks “special friends” has become the official title mounted above my ever-changing, ever-redefining relationship with this special someone. And honestly, I have never been happier to have my own words come back around to bite me. In fact, I’m considering allowing more ill-thought out statements to come flying out of my mouth just in hopes that they might come true as well. So for now, I’m content to feel silly and feel like I have no clue as to what I’m doing in all of this. Because the reality is that I don’t. God is helping me to re-learn how to do everything. Yeah, really, everything. And I’m also content to sit through about three minutes of laughter during phone calls with friends back home that can’t get over the fact that it sounds like some sort of handicap (my own father included). But you know, in a lot of ways there is a handicap placed over my relationship with the boy. Yet I’ve confidently determined that it’s a wonderful self-inflicted, self-established handicap that I fully believe is leading to nothing but great and even greater things. So with that said, I suppose I should claim it with some pride, right? So here goes: “My name is Erin Lockhert and I have a special friend.” (“Hi Erin!” –spoken in unison). There’s certainly a lot more that I could say about it all and would like to actually, but for now, in this season of settling in, I’m content just to share a lot of secrets with God and some with my roommates as well. And content to live out my days at work with a particularly silly smile plastered across my face that my coworkers now recognize and call me out on every time with comments about how I’m “so done for.” And I’m also content to sit still, or rather move forward with God, and allow him to be the one to totally belly hook me at this point. Because love begins first with falling in love with God and right now as far as things between me and Jesus go, my coworkers certainly are right: I’m so done for. But I can say that I’m intensely looking forward to experiences of actually really going fishing with this boy. Ya know, I actually wanna stand on the edge of a body of water with a pole, or a rod ‘n reel, or a stick or whatever you call it and with the boy standing next to me I want to catch a fish. He seems to like doing these sorts of things. So whenever we actually get to “go there”, I’m determined to be ready with a tackle box, hopefully a hot pink one because honestly what could be better than that, and a giddy smile plastered across my face. I never thought I’d care so much about fishing, but I’m really kind of liking the fact that the new, the awkward, and the surprising are becoming a trend. But Autumn isn’t fishing season. And there’s always the potential for ice fishing during the winter months I suppose, so in the meantime I’ve got a little while to figure out where in the world I’m going to find a pink tackle box and a decent stick with the yarn dangling from the end; maybe I’ll find it sooner than I think. God help me, I’m going fishing! My welcome to San Luis Obispo included two lovely slender framed girls from London, one holding a beautiful blue-eyed baby, jumping up and down and waving from behind a ten-foot tall chain link fence at the single runway airport just twelve miles inland from the California coast. The baggage claim carousel was about the size of a vending machine conveyor belt displaying sandwiches and Chef Boyardee ravioli in an office break room and the whole airport itself was in fact about the size of an office break room. It was quaint. And it was the perfect welcome complete with a three day heat wave that pushed record breaking temps of 113 degrees. I said I wanted warm weather and a fresh start and that’s exactly what I got. I left behind a teary eyed mother at the Spokane airport about seven hours earlier that day and for once in my life I managed to keep the reservoir of hot emotion behind my eyes from spilling out all over the place. My mom hugged me and kissed me on the side of the mouth before her eyes spoke the lyrics of a thousand different songs about goodbyes and I began walking up the ramp through airport security. I turned and watched her walk away through the sliding glass doors and instead of sadness I found myself smiling, both on the outside and on the inside because new beginnings and new hope are certainly worth smiling about. It was one of those deep internal smiles; the kind where you can feel all the corners of your insides turn slightly upward and your mouth simply follows suit. In the book I’m reading the Indonesian spiritual healer calls it “smiling even in your liver” and it’s something I’ve been trying to do more of lately. Although I’m not even really sure where my liver is located in my body, but nonetheless, I’ve been trying to smile more, even there. Church. Is different here; different and refreshing like sea breeze and I’m content to be the sea glass. And although I notice the differences quite vibrantly and sense them completely I am still having a hard time describing the differences to others. Maybe because I feel like I can’t accurately sum up what I’m experiencing here without making it sound like I’m shedding my past experiences in a negative light or somehow calling them insignificant. But the truth is that before I came here and stepped into the collage of people that comprise Mercy Church; before God changed my plans and direction completely, I was perfectly content with where I was at and I fully believed it was in fact God’s promised land and future for me; which is why I never intended on leaving it. But since the reality is that I have left that place, for now at least, and since the direction of my life has been radically changed by God himself, I am happy to report that once again, like many times before, he has brought me to a place that is absolutely, magnificently, detailed-specifically perfect for me right now. Right now Mercy Church is God’s next level for me and I’m experiencing my relationship with Jesus like a brand new 30×36 white stretch canvas. And the new, the clean, the white…white…the white start has never felt so good or undeserved. 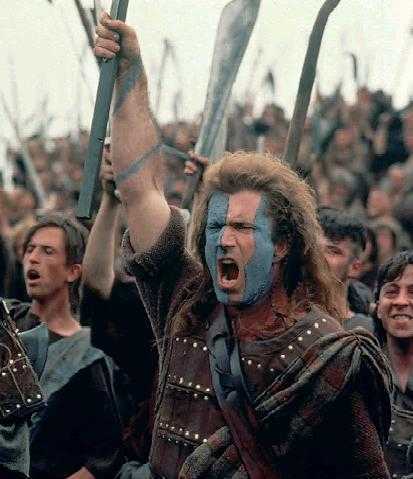 During my first week here I finally let the rest of the world pass me by for 171 minutes and I let nothing distract me from the cinematic wonder of Mel Gibson in Braveheart. And as life has continued to progress and my film experience is weeks behind me now I can still say, in all cliche glory, that Mercy Church is a community harboring young Wallaces and I’m anticipating the freedom that the Lord is bringing me into through these lives. Because God has recently brought me through quite the exodus and I can already hear the raven’s sweet song of freedom coming from just over the garden wall. Roommates. I have four of them. Jenna, Shawna, Danielle, and Yvonne. We live in the Lighthouse, named appropriately after the sunroom on the front end of our house that other than the floor and two small side panels is formed completely of glass. We could have very well called it “the fishbowl”, but the Lighthouse sounded more elegant and in my own words had “Yay symbolism!” But as for my roommates: They’re beautiful, both in the sense that they are people to sit back and take in with a cup of tea and in the sense that they bring rivers of kindness and compassion and joy into the world. However, the fact that I am living in California with four girls slightly my elder, who I had previously never met before I actually got off the tiny plane at the tiny airport on the south end of town, and the fact that I actually like it, still boggles my mind. Probably because I made it a goal a long time ago to never need women in my life again, probably for the same reasons that most women make similar vows to themselves. (I blame daytime television and Cosmo.) And because I brilliantly managed to execute that plan up until a Spring Break mission trip to Las Vegas during my freshman year of college where the Holy Spirit decided to stick me with a sharp right hook and side jab to the head that shattered my way of thinking and caused me to do the same to that nasty covenant. Since then it’s been an interesting trek back through the forest towards the wide open fields and the Lord continues to make me do all sorts of things along the way that I find uncomfortable and ridiculously freeing all at the same time. Like letting other people into my madness and not just lingering outside the front door of theirs. And the more I seem to let my roommates and other women into my life, the more I genuinely like myself and feel at peace with, well…everything. I admit I still fight to embrace the whole “I love cooking and gentleness and candle parties” side of having close-knit relationships with women at times, mostly just because I’m insecure, but I bought a spatula and some house plants last week so I figure at least I’m on my way. And in the meantime I’m experiencing the growing enjoyment of having four women in my life to laugh and cry with, who really know me, and who can teach me how to do all sorts of wild and adrenaline-pumping things like hang curtain rods and refinish furniture with the leftover paint found in the garage. One of my most victorious moments since being here involved a power drill and the phrase, “You bet I did that!” So I’m looking forward to the open fields and spending a year at 2684 Johnson Street in The Lighthouse with the four blessings and cupboards stocked full of treats from Trader Joe’s. Work. About a month before I left Spokane for California my mom took me out shopping for business clothes. We spent an entire day buying enough slacks and blazers and stiff-necked button downs to fill up the entire left side of my Miranda closet. Then I spent the next few weeks filling out online applications for jobs that would allow me to display my new wardrobe from behind a gray-freckled plastic desk from Office Depot, hopefully with minimal amounts of gum stuck underneath. My destiny would be to sit at that desk, sip my Bucks, and do adult things….amazingly boring adult things while constantly itching beneath the layers of adulthood and polyester that cramped my hamstrings and my style. So I am pleased to report that every single overpriced, librarian-like turtleneck and matching sweater vest are still hanging in my closet with the tags attached and instead I am sporting colorful strappy tank tops, jeans, and flip flops to the sleek brick building on the corner of Higeura and Osos that sits in the heart of downtown SLO, surrounded by streets lined with trendy boutiques and places to eat. I still get to sip my Bucks and I sip it to loud music and from within a cloud of sweet smelling cologne and familiar teen angst. I can’t really describe my job as being prestigious and I actually think that’s maybe why I like it so much. Thus far, Abercrombie & Fitch, store #496 Court Street has been good to me. It’s been challenging and fun and best of all its right down the street from Yogurt Creations ( a place I love to visit so frequently that I am currently on yogurt probation until I can learn to have some self control with the frozen treats and delicious candy toppings). My job has also allowed me to abstain from correcting my unprofessional habit of saying the word “like” too often in sentences for at least another year of my life, maybe two if I’m lucky; something my mother is extremely disappointed to hear (Sorry mom!). But right now I’m too caught up in all things new and exciting and still trying to embrace the role of manager: something I find challenging and growth-causing both in the realms of practicality and spirituality. And although I’ve only been stationed at A&F just upwards of a month, I am already feeling quite at home within those walls, trashy pictures and all. In fact I think the pictures keep me grounded; keep reminding me of why I’m really there. I’m not sure how long my time at A&F will last and I have no clue as to what kind of job may follow. A big part of me still hopes and plans on filling out that CRU staff application sometime in the next few years, but I suppose that in all reality I have no clue as to what my life will be like then. (Seems to be a growing trend). But for now, I am content standing in the gap for the people there. Content in experiencing the Spirit of God regaining his ground within that place; regaining his ground within me too. Content in letting those I’m managing love and correct me. Because God is raising up a generation of passionate Christ followers…well-dressed Christ followers, at Abercrombie & Fitch in San Luis Obispo, California and it’s really an incredible thing. Word. About a month ago I tried to pick up a second major just so I could remain in the pseudo- reality that is college life in Pullman, Washington, but my parents only agreed to fund that endeavor long enough for me to earn the four year degree in precisely four years. So the brilliant hope of lengthening my days as a carefree dependent quickly faded as did my last days in the north tower of the infamous Stephenson castle. My humble room on the 13th floor overlooked the treetops of the tiny town that stole my affection over the span of my stay with the simple charm of school spirit wrapped up in amazingly grotesque fans at football games who yell curse words and hide flasks in their socks and North Face fleece pockets. So with the golden day of graduation quickly approaching and the threat of change prominently camped out on my front lawn, I did my best to welcome the last few weeks of college-dom with true Cougar posture: I grabbed a plastic fold-out chair and a case of Busch Light, cranked up the tunes, and sat myself right down next to Change on the semi-green grass and we threw ourselves a party. Among the sentimental ‘lasts’ and drawn out goodbyes with people I’m absolutely crazy about, figuring out post-grad plans proved to be as easy as maneuvering a rusty sailboat on a rainy, windless day. And considering that the last few calendar months had been memorably marked by a blanket of extreme bitter cold hovering over the tundra-like landscape, the kind of cold that turns generally nice and good-hearted people into heinous whiners you consciously avoid, I would have given just about anything for a little bit of sunshine and direction in my life. For some reason Pullman missed the memo this year that springtime had come. It was late April and I was still trudging to classes wearing my winter parka and snow boots. Finals week I saw snow falling from the sky. Everywhere around campus there were girls with bronzed skin peeking from the tops of their blouses, still draped in layers of last winter’s fashions. A few brave souls occasionally sported shorts and skirts, but accessorized their ensemble with colorful shivers and blue lips as they strutted by. But anyone who’s hung around good ‘ol Pullman for more than a half-day could tell you in a breezy, flippant sort of way that this is no surprise. Our dear little home-away-from-home has a closet full of major psychological issues that have yet to be addressed. 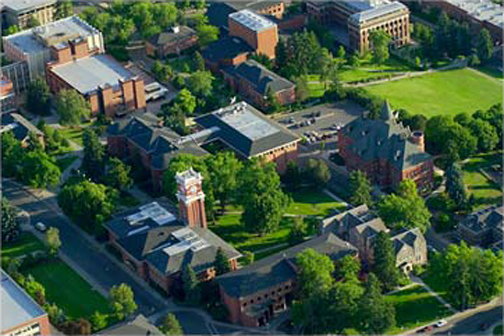 Pullman suffers from an array of mood disorders including bipolar disorder, major depressive episodes, and manic depressive disorder, probably a result of repeated heavy trauma experienced from too many football seasons gone wrong and a hundred and twenty-something years of World Class, Face to Face hangovers. Too many days this school year I experienced elements from all four of the seasons before lunch time, sometimes even before my 10:00am coffee break at The Bookie. So ironically, I found my voyage toward life outside Cougarville and decisions concerning my future plans synonymously tied with the unpredictable and uncanny Pullman weather patterns. Therefore, my first sail boating experience was anything but smooth sailing. I never imagined I’d be one of “those people.” I didn’t understand “those people.” Like models, they were melodramatic. But nonetheless I spent the majority of my last official Spring Break curled up on the living room couch at my dad’s house, clutching a box of Kleenex, and pulling my green fleece blanket over my head in an attempt to hide my scared and sobbing face from the world. For the previous few weeks I had been bombarded with the question of “So what are you doing after graduation?” And after I reluctantly responded with a casual “I’m not sure,” or some other equally-lame explanation, after a brief pause and a blank stare, I had the privilege of hearing about how my fellow classmates had bagged themselves a big job in a big city, succeeded in earning their MRS degree and were in the midst of planning their big day, or had plans of jet-setting to some trendy international hot spot for an undisclosed amount of time. As for me, I found myself paralyzed in fear and still caught on the coattails of heartbreak, wishing that things were different. I had only managed to turn in a handful of job applications at places I could have very well worked at during my high school years… and most of them never even called me back. So I questioned the credibility of all the people who ever lead me to believe I was special because I spent four years playing around on an intellectual jungle gym with tall brick buildings that stand for prestige and knowledge. So, with swollen eyes and the seeming absence of divine direction, I faced the dim reality that I, miss college grad, couldn’t even get a callback from the Gap. I was totally one of “those people,” and I was inviting everyone I knew to my lawn-chair gathering turned pity party. Yet in the middle of my tsunami of emotional chaos I talked to God, because that’s what I know how to do and because my dad said maybe it would help me shut up and stop crying all over his expensive black leather couch. I don’t think God necessarily talked back, at least not in any way I really understood at the time, but I let him know all about the thoughts and concerns that were floating around in my head; the rational and the irrational…but mostly the irrational. And so the dialogue began. It was the kind of conversation that had a lot of word jumble followed by extended pauses and sentences that end with a lot of those squiggly-marks with the dots underneath. And the dialogue continued further and further into what the calendar said was spring. I was prepared for the change and warm weather, with toe nails that were painted a cheery shade of Cabana Sunset pink. However they remained smushed down into the depths of my winter boots along with the hope of ever figuring out what God wanted me to do with my life after graduation. I considered a few options including the terrifying proposition of moving back in with the parents, but every time I felt as if I was getting somewhere…it snowed…again. It got dark. Things failed to make sense and any plans I made seemed brittle. So I ate a lot of ice cream and tried to forget about the weather. And the dialogue also continued with a handful of the kind-hearted people in my life who were willing to listen to my thoughts as I sorted through the options and the hypothetical result of each potential decision. These are people I have since labeled as the “good listeners” in my life; the kind of friends you invite over for dinner and go on long walks with. They listened while God still didn’t seem to be saying much. So I waited. We waited; me and the good listeners, we waited for God to make a move. And it was semi-uncomfortable sitting there in my plastic lawn chair beside Change on the semi-green grass because Change isn’t always so friendly and he doesn’t do much to make you feel at home. But a few weeks before graduation Saturday my sailboat caught a warm, southbound breeze and things noticeably started to move, all about the same time I finished my final research paper. Change finally got up out of the lawn chair and Springtime came strutting into Pullman, fashionably late of course, but she showed up nonetheless clothed in glory. And with her, she brought answers and hope and all kinds of things I’d been waiting for. So I forgave her for being so late, put on my flip flops to show off the Cabana Sunset pink polish and bought a plane ticket for the California coast because that’s where Change beckoned me to go. The day before I left Pullman I carved my initials into the wall of the stairwell where I had my first and worst college kiss. Not sure why I did. I just happened to find myself walking past that spot and felt like being sentimental. I made some important life decisions before I bid farewell to that place; before I dyed my hair a lighter shade of blonde and traded in my worn out winter parka for a bottle of Coppertone and SoCal flair. I decided to bury my brown box of regrets on Crimson soil which included all the fuzzy memories from every time I ever set foot into the dirty basement of Mike’s and for being like a brick wall at times to those around me. I also decided it was in my very best interest to avoid dating guys from Washington in the future, specifically those named Ryan. In fact, I decided I should probably avoid dating anybody whose first name even begins with the letter “R” just to be safe. Finally, I decided that waiting on God, even when his response seemed slow like the seasons, was always going to be worth doing because springtime always comes back around, kind of like skinny jeans and polo shirts. I prayed for a life on the narrow path and stuck a pebble in my pocket to mark the memory. And with that I finished packing up my life into boxes and duffel bags. Graduation day was brilliantly sunny, and so is the place where I’m going.